As the sanctions against the Russian government continue to be implemented by western nations, Moscow has been forced to look to Asia for economic and strategic partnerships. The Kremlin has been negotiating significant trade deals with two giants in the region for years now, with the prospect of a new geopolitical reality emerging if Russia, Iran and China continue to forge stronger ties into the future. At the beginning of August, Russia and Iran signed a historic $20 billion oil deal which will see the two nations enhancing cooperation within the “oil and gas industry”, in addition to strengthening economic collaboration. The deal proposes that Russia will assist Tehran in developing its energy infrastructure along with purchasing Iranian oil, in exchange for Iran importing consumer goods and agriculture products including wheat, leather, pulses and meat. Further talks are set to take place at the Russia-Iran intergovernmental commission meeting in Tehran on September 9-10, which will see the details of the deal cemented. Relations between the two nations are complex and have ranged from collaborative to hostile in the last few decades, with a degree of tension existing between Moscow and Tehran over many issues today. The Caspian Sea is one dispute that has strained relations between the five bordering countries since the collapse of the Soviet Union in the early 1990’s. Russia, Iran, Kazakhstan, Azerbaijan and Turkmenistan are unable to agree on the legal portion owned by each state, in a sea which is home to vast deposits of oil and gas. Iran has also been displeased by Russia’s support of United Nations Security Council Resolutions which haveimposed sanctions on Iran over the past decade, stunting the development of the Iranian economy. Yet the two nations have increasingly found themselves sharing the same geostrategic interests, especially in their support of Bashar al-Assad in his fight against western sponsored proxy forces in Syria. A closer strategic alliance with Iran could also benefit Russia through Tehran providing regional assistance to help stabilise the Caucasus and Central Asia. A vast amount of terrorist cells – which have close links to the CIA - have been active in the Caucasus for years now, in an effort to destabilise the underbelly of the Russia Federation. 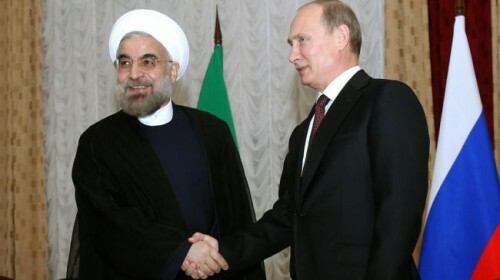 The strength of Iran and Russia is underpinned by the two powers holding considerable deposits of oil and gas, and an increase in cooperation between Tehran and Moscow could be mutually beneficial considering the sanctions imposed on each state. Iran is a natural dominant player in the Middle East as it has the “fourth-largest proved crude oil reserves” on earth, along with the “world’s second-largest natural gas reserves”, in addition to having the 3rd largest population in the region – of over 80 million. Russia holds the largest natural gas reserves in the world along with the eighth largest proved crude oil reserves. Moscow could be an essential importer of Iranian oil as the latest round of sanctions, imposed by the United States (US) and the European Union (EU) in 2011/2012, have had a sizable affect on the production and revenues received from the Iranian energy sector. Export revenues from oil and gas have plunged by47% in the fiscal year 2012/2013 to $63 billion, according to the IMF, compared to an export revenue of $118 billion the previous year. Russia has also announced it will build a rail line in the North of Iran, running from the city of Rasht on the Caspian Sea to Astara on the Azerbaijan border. The decision by western leaders to impose sanctions on Russia in March has pushed Moscow closer to Iran and China, as well as strengthening the BRICS group and the Eurasian Economic Community. In May, Russia and China agreed what was hailed by many analysts as the ‘deal of the decade’; when the two powers signed a 30 year gas deal totalling $400 billion. China and Iran also plan to boost trade over the next 10 years by a factor of 5, with trade expected to reach $200 billion by 2024, compared to $40 billion in 2013. Iran is a major supplier of crude oil to China with demand set to remain high as Beijing is now the largest net importer of crude oil, surpassing the US in September of last year. If the trend continues into the future, the emergence of a Russian-Iranian-Sino alliance would come to dominate the continent of Asia, and if truly independent of western influence, would seriously challenge the Anglo-American international order. It’s evident that the European Union is not ready for this turn of events. 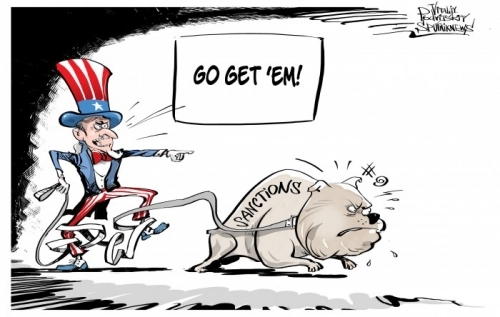 Instead of bowing to Western sanctions Russia responds in kind imposing the sanctions of its own. Only now Europeans appear to understand that the economies of Russia and the European Union are closely intertwined and that obediently dancing to the tune of the United States leads nowhere. Western media outlets are inundated with assessments of how effective sanctions and countersanctions are. There are people who have directly invested into Russian economy and those who make profit thanks to stable relationship with Russia. The punitive measures may make reconsider the whole pattern of making investments. Russia has badly hit the European agriculture. The measure has direct impact and indirect implications. The direct affect is related to the ban on Polish fruits; dairy from Finland and the Baltic States and fish from Norway …It entails implications. For instance, French farmers may not be happy to see Polish farmers expand into European market trying to compensate the losses inflicted by Russia and squeezing out other suppliers. It may reshape the whole structure of production and consumption in the European Union and result in market saturation to strike all the producers at once. That’s the way it can be with poultry too. Ireland is dissatisfied. Estonia may lose around 0, 3% of GDP. 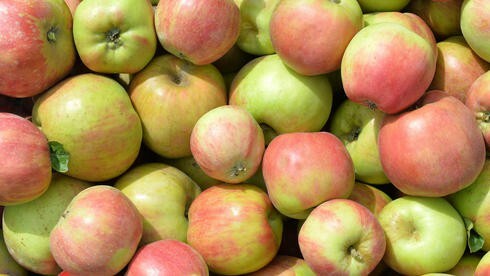 Lithuanian farmers may lose 927 million euros. Latvia may lose 55 million euros. The European Commission formed a working group to assess the consequences of Russian food embargo against the European Union. But the Commission cannot really lend a helping hand to farmers. The European agricultural sector rightly demands compensations for the losses inflicted by political steps that were not economically motivated. The European Agricultural Fund for Rural Development, created to tackle the situations when agricultural production cannot be sold due to political reasons, is not of great help with the funds that do not exceed 400 million euros while only three countries of the European Union out of 28 – Germany, the Netherlands and Spain - face the losses of around 1, 5 billion euros. Actually the European Union says frankly that it has no money for compensations and the political decisions of dubious nature will be brought into life at the expense of producers. True, some European producers managed to get at least symbolic compensations from Brussels; on August 12 it was announced that the European Union will buy out 10% of peaches and nectarines allocating 30 million euros for the purpose. US businessmen also have something to worry about. New sanctions against Russia will speed decline in auto sales at the time the demand for cars is sliding down. European manufacturers had been looking to Russia to double sales and profits to make up for increasingly tough competition at home. Now their hopes appear to be dashed. The European business is looking for the ways to get around the ban and stay in Russia. One of the options is getting to Russian market through Belorussia and Kazakhstan. The producers of Norwegian salmon are looking for the ways around through Chile. Until now Brussels has not given much attention to the protests of business community. It just makes lukewarm remarks. But it will have to tackle the issue seriously. First, no matter all the sanctions imposed, the Russia’s GDP is not going down, it continues to grow. The pace is not very impressive but still it’s going up. According to Russian Federal States Statistics Service, the GDP grew in the second quarter of the year by 0, 8 % and 0, 9 % in the first quarter. Why impose any sanctions at all, if the only thing they result in is the reduction of European profits? Second, the European business finds it hard to understand the logic of Brussels succumbing to the United States while the sanctions imposed by America are very selective. Washington prefers Europe to shoulder the major burden of losses. On August 9 US oil giant ExxonMobil started drilling in Russian Arctic Ocean no matter its Russian partner Rosneft was under sanctions. This example of double standard approach on the part of the one who dragged the European Union into the sanctions adventure looks more like betrayal. No doubt Europe is going to scrutinize more closely the economic initiatives coming from the United States, first of all the US-proposed Transatlantic Free Trade Area (TAFTA). Becoming part of TAFTA the European business, weakened by Russian sanctions, could find itself trapped. If Europe does not change the sanctions policy towards Russia soon it may result in political complications. Big business may revolt to entail wide discontent among grassroots. The loss of profit directly affects working places. From Brussels’ point of view these difficulties could be overcome at the expense of labor immigrants though people will hardly accept this approach. There is one more problem that Brussels will have to inevitably face - the strengthening of Euroscepticism and anti-US sentiments. Finally, the United Stated exerted pressure to make Europe impose sanctions against Russia. It will result in further schism inside the European Union which is had been divided enough even before the sanctions were introduced. La filiale espagnole de la marque Coca-Cola a annoncé un énorme plan social le 22 janvier 2014, prévoyant la fermeture de quatre usines et le licenciement de plus d’un millier de salariés. Peu concernée par la terrible crise systémique espagnole et le taux de chômage endémique ibérique, la grande firme internationale Coca-Cola n’a pas fait dans le détail. La réponse ne s’est pas faite attendre. D’abord de manière assez classique avec une grève et des manifestations, puis de façon plus originale avec un appel au boycott des produits de la marque, comme l’indique un article du site internet de Courrier International en date du 18 juin 2014. 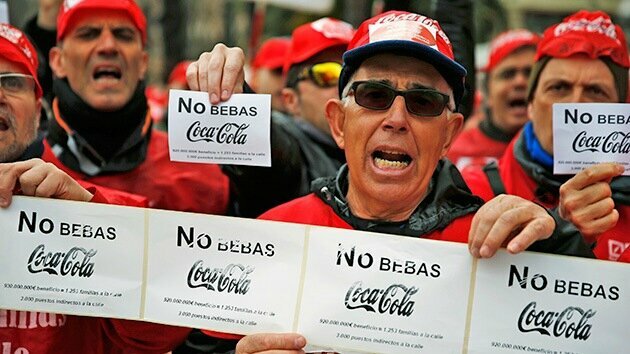 Le slogan des salariés espagnols de Coca-Cola, patriotique et social, est éloquent : « Si Madrid ne fabrique plus de Coca-Cola, Madrid n’en boira plus. ». Une belle démonstration de patriotisme économique par la base, puisque les états européens sont défaillants à protéger leurs économies des circonvolutions des groupes prédateurs venus d’outre-Atlantique. On pouvait douter du succès d’une telle initiative dans une Europe américanisée accro aux boissons gazeuses et trop sucrées du géant américain. Et pourtant, la consigne a été largement suivie par le peuple espagnol, et particulièrement dans les régions du centre (Vieille Castille, La Manche, Estrémadure et Madrid). Le journal espagnol El Economista a révélé que les ventes de la marque avaient diminué de moitié en Février, par rapport aux chiffres de l’année 2013. Il s’agit même de la plus grosse chute jamais enregistrée par la marque ! Le boycott a donc porté un dur coup à cette entreprise hégémonique, au combien symbolique de la globalisation sans visage. Un coup durable car les experts estiment même que les ventes ne devraient pas remonter avant 2017, ce dont on peut se réjouir franchement. Quelle meilleure arme contre ces entreprises américaines apatrides qui licencient dans notre Europe en crise que de boycotter leurs produits ? C’est le seul langage qu’ils peuvent comprendre, et puis ne sommes-nous pas suffisamment compétents pour produire nous-mêmes des boissons gazeuses de qualité plus respectueuses de la santé (et tout aussi addictives) ? L’idée des manifestants espagnols est donc brillante car d’une efficacité redoutable. Imaginons une telle chose à l’échelle européenne, ce serait un moyen de nous faire respecter, de montrer que nous ne sommes pas de dociles moutons de panurge prêts à acheter tout ce que l’on nous demandera. Nous devons montrer toute notre opposition à la laideur et à l’infamie qu’ils nous imposent, mais le faire réellement plutôt qu’en protestant dans le vide. Voilà donc une bonne initiative, mais elle ne saurait être durable en raison de la nature même du capitalisme contemporain qui génère des pseudo-besoins désormais si ancrés dans nos comportements quotidiens qu’ils nous semblent naturels. Annihiler l'"envie de Coca", ou plus généralement l'envie de marques, est impossible à grande échelle dans le monde contemporain. Jean Baudrillard, grand observateur de l’aventure américaine, trouva dans « La Société de Consommation », une exacte définition pour l’horizon de l’homme contemporain : « homo oeconomicus ». Il précise cette notion comme « fossile humain de l’âge d’or, né à l’ère moderne de l’heureuse conjonction de la Nature Humaine et des Droits de l’Homme, est doué d’un intense principe de rationalité formelle qui le porte : 1- A rechercher sans l’ombre d’une hésitation son propre bonheur ; 2- A donner sa préférence aux objets qui lui donneront le maximum de satisfactions. Tout le discours, profane ou savant, sur la consommation, est articulé sur cette séquence qui est celle, mythologique, d’un conte : un Homme, « doué » de besoins qui le « portent » vers des objets qui lui « donnent » satisfaction. Comme l’homme n’est jamais satisfait (on le lui reproche d’ailleurs), la même histoire recommence indéfiniment, avec l’évidence défunte des vieilles fables ». Le sociologue français conceptualise un homme de besoins, un homme qui a le « droit » de « satisfaire » à ses besoins. Les « besoins » dont il s’agit, ne sont pas d’ordre naturel comme manger ou dormir à l’abri, mais bien des « besoins » d’ordre symbolique et répondant à des critères de confort annexe ou à l’hédonisme ludique. En somme, nous sommes infantilisés, tels le chien de l’expérience de Pavlov nous voulons notre Coca car son gout est étudié pour nous plaire. Et il n'est pas réaliste de penser pouvoir supprimer tous ces pseudo-besoins aux peuples d’Europe. Qui en « révolte contre le monde moderne » pourrait se priver de facebook ou n’a jamais déjeuné sur le pouce au Mac Donald ? Il nous faut d’abord faire notre examen critique et comprendre que loin d’être des personnalités extraordinaires hors du monde et de ses tentations, nous sommes, nous aussi, pleinement parties prenantes de ce monde moderne que nous critiquons. Alors plutôt que de lutter frontalement contre un ennemi plus fort, nous devons nous adapter et pratiquer l’aïkido, c’est à dire retourner sa force de séduction contre lui même, produire des ersatzs de meilleur qualité que les produits de consommation de masse qu’ils nous imposent. Le but est de contourner ce système. Coca-Cola jouit d’une situation quasi monopolistique sur son secteur de marché malgré les initiatives de boissons régionales comparables, tel le « coca » breton Breizh-Cola, ces boissons n’arrivent pas encore à bousculer comme il le faudrait le géant américain mais elles doivent plus que jamais être soutenues. Elles donnent du travail aux européens vivant en zone rurale, elles font aussi travailler les agriculteurs locaux, enfin, et peut être plus important, elles affirment un enracinement local défiant l’autorité centrale. La lutte contre le TAFTA et le TISA passe par plus d’intelligence économique et d’innovation, au delà d’une future mise au pas de la finance spéculative qui n’est pour l’instant qu’un vœu pieux. Dans le Lot un brasseur produit la bière Ratz (je vous la recommande), après deux années de galères noires, il exporte désormais son produit dans tout le grand sud ouest sans le soutien d’aucune grande chaîne de distribution. A nous désormais, de trouver les clés pour proposer une alternative au modèle consumériste imposé. Une troisième voie qui soit ancrée dans le présent tout en rejetant les manifestations les plus creuses et nihilistes du monde moderne. Nous ne sommes pas des réactionnaires, nous sommes des hommes d'action.